Meeting the needs of our community in fire prevention, fire suppression and rescue. Utilizing and improving the dedication and skills of our most valuable resource, OUR MEMBERS. Constantly improving all of our services and operations. Give top priority to firefighter safety and environmental concerns. Encourage the professional and personal development of our Members. Work as teams to take full advantage of our skills, knowledge and creativity. Communicate openly and honestly to our Members and community to inspire trust and confidence. 7-75 has an overall length of under 38 feet and a wheelbase of 233 inches. That, coupled with the phenomenal cramp angle of the Velocity cab w/tak4 independent front suspension will allow 7-75 to access streets, driveways and parking lots that 7-Tower is too big to fit into. 7-75 is also equipped with a 500 gallon water tank, 3 pre-connected 1-3/4″ hose lines, 1 pre-connected 2.5″ hose line, 600 feet of 2.5″ dead load, 1000 feet of 5″ large diameter supply hose and over 125 feet of ground ladders allow 7-75 to function as both a ladder truck and do engine work if needed. 7-Patrol is a “Support” vehicle, meaning it is used to transport manpower and equipment if need be, 7-Patrol has no equipment other than a built-in radio system. 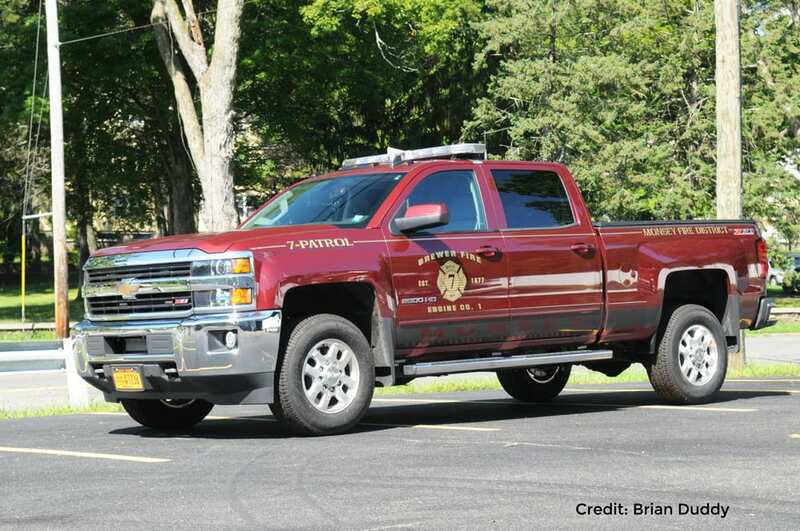 7-Patrol is a 2015 Chevrolet Silverado 2500HD Z71 fitted with a full emergency vehicle package (Lights and Siren). 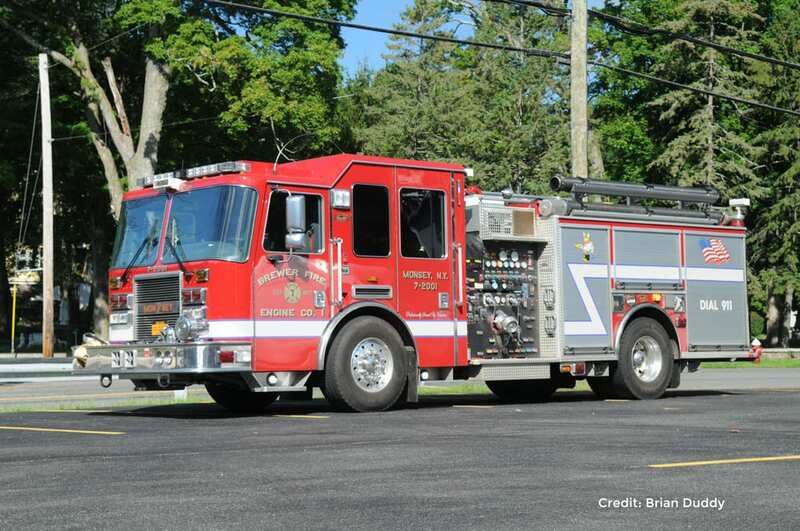 7-TANKER is a 2013 Pierce “PUC” pumper. 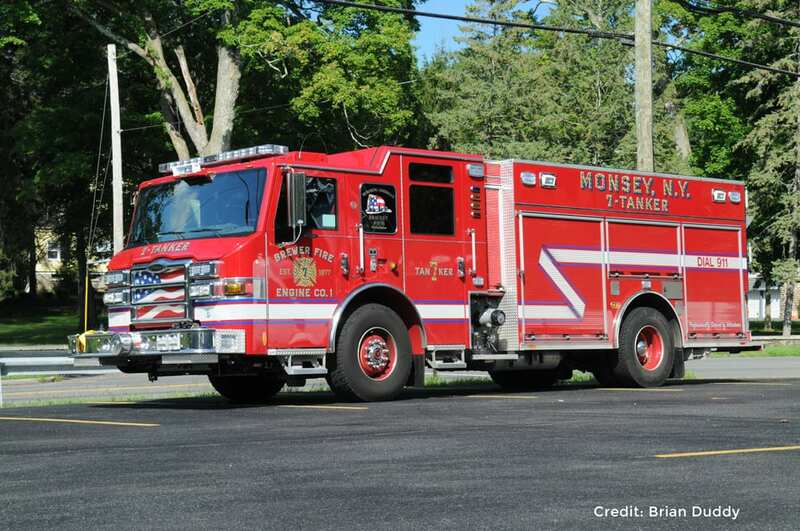 7-TANKER is the first apparatus to respond to all structure fires. With its 7 pre-connected hose lines, 800 feet of split dead loaded 2.5″ hose, 1200 feet of LDH supply hose, 10KW hydraulic generator and almost 100 feet of ground ladders it was designed to carry all of the water, hose, tools and other equipment necessary to begin initial fire attack operations at a structure fire. 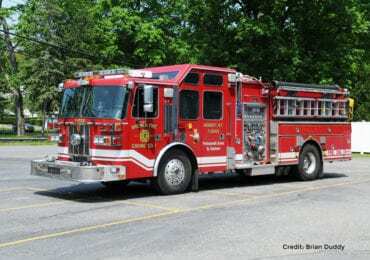 7-TANKER is capable of pumping 1500 gallons of water per minute and carries 970 gallons of water in its tank and 30 gallons of class A foam concentrate. It is powered by a Detroit Diesel DD13 500 horsepower engine and has an Allison EVS-4000 5 speed automatic transmission. 7-Tanker classifies as a “QUAD”. 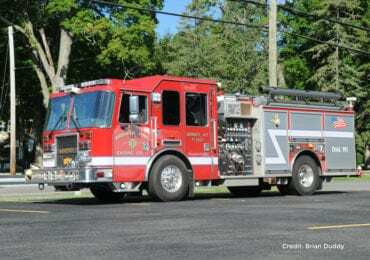 7-2000 is a 2001 Sutphen pumper. 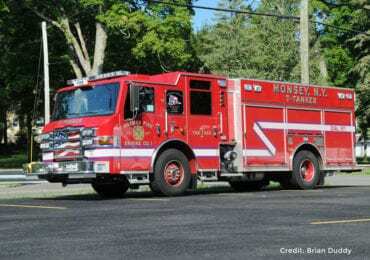 7-2000 is the apparatus that responds to mutual aid calls for pumpers(unless another apparatus is specifically requested) and is capable of providing an initial attack on any type of fire or providing an additional supply of water to other apparatus. 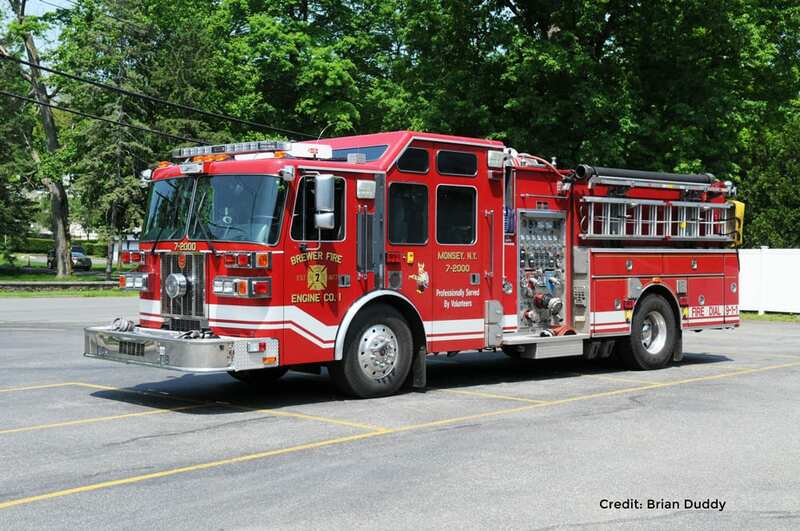 7-2000 is capable of pumping 2000 gallons of water per minute and carries 1000 gallons of water in its tank. It is powered by a diesel engine and has an automatic. 7-2001 is a 2007 KME pumper/rescue with a full tilt 134″ long “Predator” XMFD style cab with a 12″ raised roof over the rear crew area. 7-2001 is first due to all vehicle fires and outside Haz-Mat calls and is second due to structure fires and inside Haz-Mat calls where its role is to secure a water supply. It is capable of pumping 2000 gallons of water per minute and carries 750 gallons of water in its tank. It also has a 3 line Foam Pro model 2002 foam proportioning system and carries 30 gallons of class “B” foam concentrate and a Foam Pro “power fill” system for ease of refilling the foam. 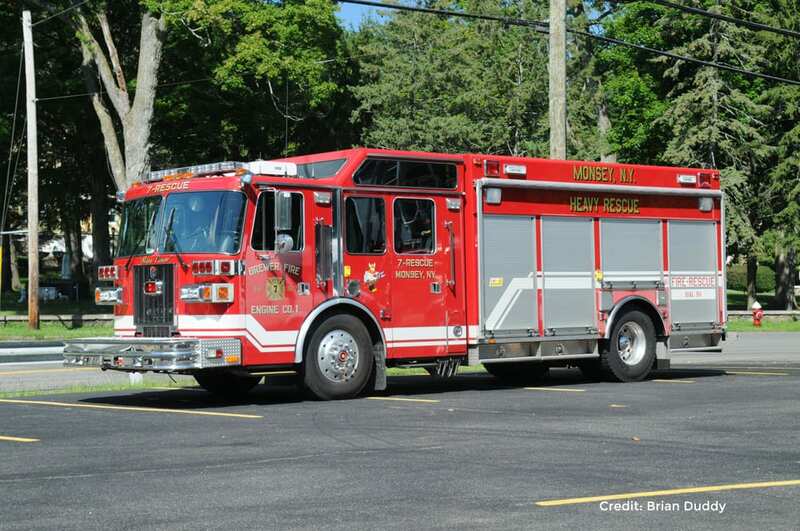 7-2001 has also been designed and equipped as a “Pumper-Rescue” and responds second due to vehicle extrication and rescue calls. 7-2001 is powered by an I-6 Cummins ISM 450 diesel engine and has an Allison automatic transmission. The overall vehicle length is 31”5” with a 185” wheelbase and the overall height is 9’7”. It is equipped with a 15,000 watt “Smart Power” PTO driven hydraulic generator for A/C power. 7-2001 can seat five (6) firefighters including the driver. Six (6) Scott model 75 4500 PSI self-contained breathing apparatus (SCBA) units are provided along with six (6) spare SCBA cylinders. 7-2001 carries 1200 feet of five inch (5”) large diameter hose (LDH) to obtain an additional water supply, usually from a fire hydrant. A total of six (6) pre-connected hose lines of various lengths and sizes are carried. The hose lines are color coded as follows: red hose-”mattydale bed” over pump panel-200 ft. of 1 and 3/4” hose. yellow hose-”mattydale bed” over pump panel-200 ft. of 1 and 3/4” hose. blue hose-rear hose bed-300 ft. of 1 and 3/4” hose with “navy fog” nozzle. orange hose-rear hose bed-250 ft. of 2 and 1/2” hose. White hose-front bumper trough-100 ft. of 1 and ¾ hose. booster line-200 ft. of 3/4 inch hose on reel. 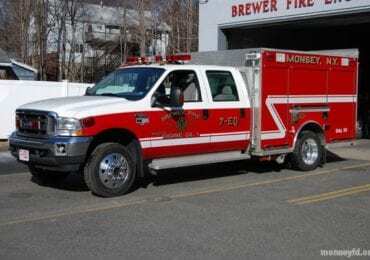 7-RESCUE is a 1997 Sutphen/SuperVac heavy rescue apparatus. 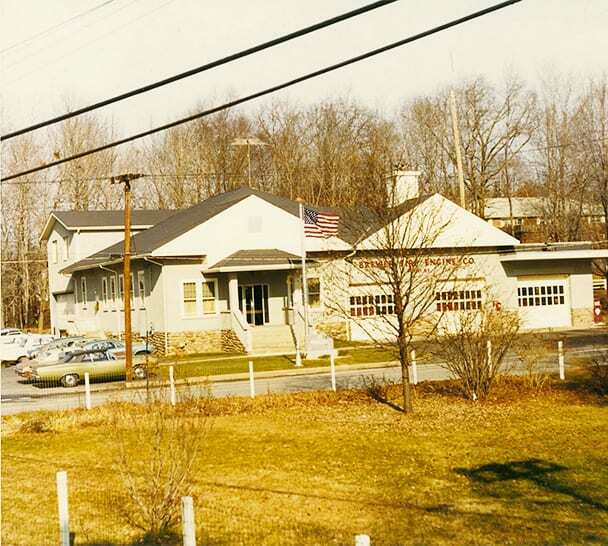 7-RESCUE is the first apparatus to respond to all rescue calls and it also responds to all structure and vehicle fires and all hazardous materials calls. 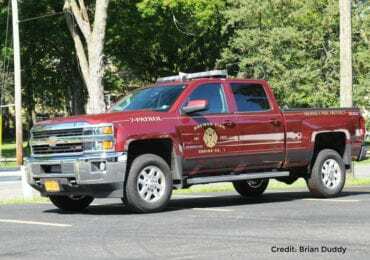 It was designed to carry special rescue tools necessary to rescue victims trapped in vehicles, building collapses, or other incidents and also provide support operations such as firefighter rehabilitation at all emergencies. 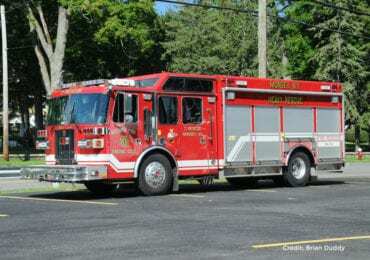 7-RESCUE has a generator capable of supplying 48,000 watts of electric power to support two 9,000 watt light towers, built-in and portable lighting, ventilation fans and other electrically powered equipment. It is powered by a 370 horsepower diesel engine and has an automatic transmission. 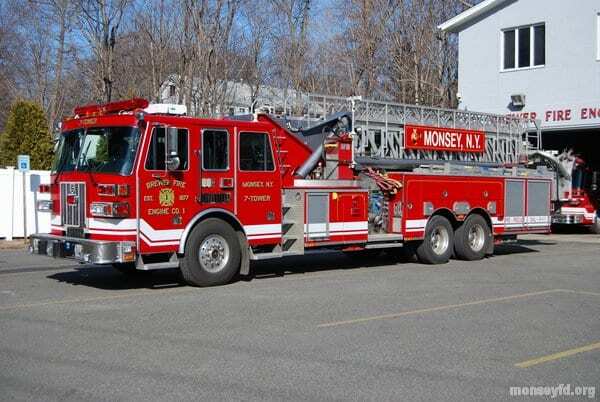 7-TOWER is a 1998 Sutphen aerial platform apparatus. 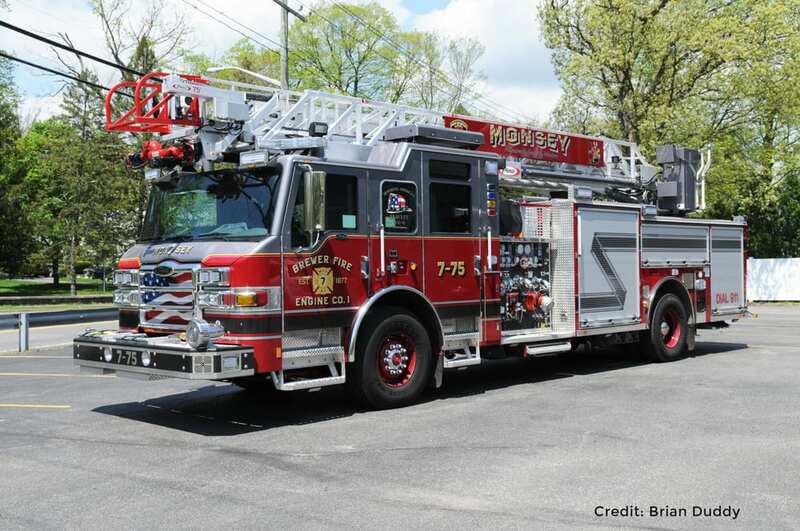 7-TOWER responds to all structure fires and was designed to carry all of the ladders, tools and other equipment necessary for ladder company operations and be able to perform engine company operations if necessary. 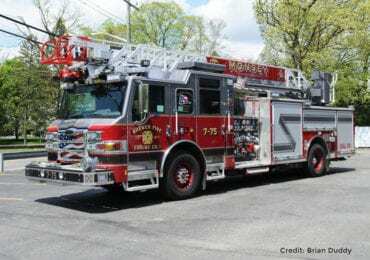 7-TOWER has a 95 foot telescopic ladder with a “bucket” which can carry 3 fully equipped firefighters to a height of approximately 100 feet (or to the roof of a 7 story building). The “bucket” has two master stream nozzles, each capable of flowing 750 gallons of water per minute. The “bucket” also contains a breathing air system, floodlights and a variety of firefighting equipment that might be needed while rescuing persons or extinguishing fires. 7-TOWER is capable of pumping 2000 gallons of water per minute and carries 300 gallons of water in its tank. It is powered by a V-8 diesel engine and has an automatic transmission. 7-EQ is a 2005 Ford F 550 XLT Super Duty crew cab/KME light rescue. 7-EQ has a CFS -25 air compressor cascade system. 7-EQ also carries 8 cans of high expansion foam, and water pump out equipment. 7-EQ rolls on confirmed structure fires, car fires and upon an officer’s request.